The biggest shopping weekend of the year is now behind us! So what can mobile marketers learn from it to build successful campaigns for the rest of the holiday season? For many online brands, the Black Friday weekend is the most important 72 hours of the entire year. Mobile marketers plan campaigns months in advance in order to drive purchases, and the pressure is on to deliver. Over 40 million Black Friday campaign notifications were sent globally over the weekend via CleverTap, with an average click-through rate 5x higher than regular campaigns. What’s behind this success? Our data science team dug deep into the data and found some fascinating trends driving this spike in user engagement. Get users excited about the amazing deals you’ve got in store!Send reminder push notifications a few days before Black Friday to give users an opportunity to create shopping lists and plan gifts for friends and family. Grouper sent a reminder push notification to their user base 1 day before the shopping weekend began. The result? Grouper saw 1.5x its average Daily Active Users even before the offers began, and 3x its average Daily Active Users over the Black Friday weekend. Black Friday may have originated in the United States, but it’s since spread across the globe. 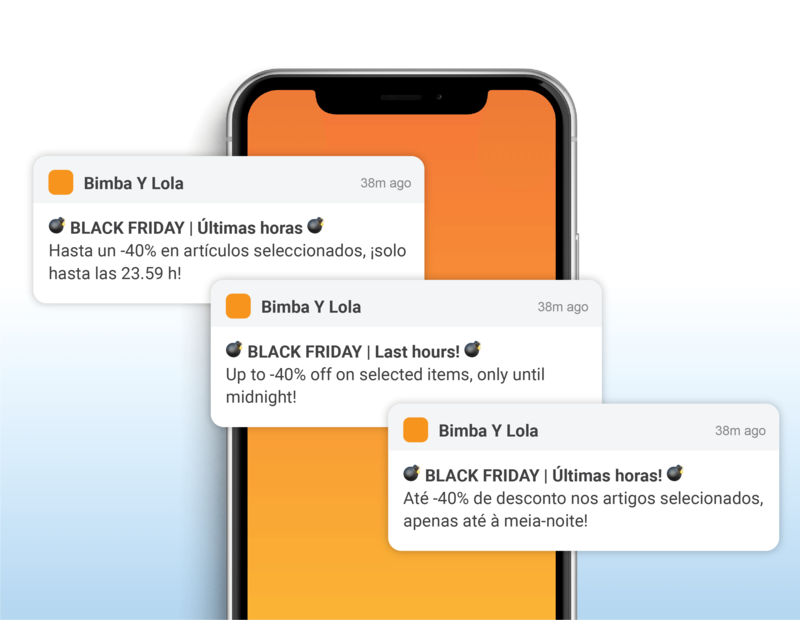 So send push notifications in your users’ preferred language.Bimba Y Lola is one of the fastest growing labels in the world, with a multinational user base. The brand customized their push notification text language based on user location and preferences and received CTRs as high as 21% for this campaign. For the Love of Emojis! Emojis are fun, easy to understand and stand out among all the text-heavy notifications on a user’s lock screen.We saw several brands use emojis in their Black Friday campaigns to make their push notifications compelling and unique. 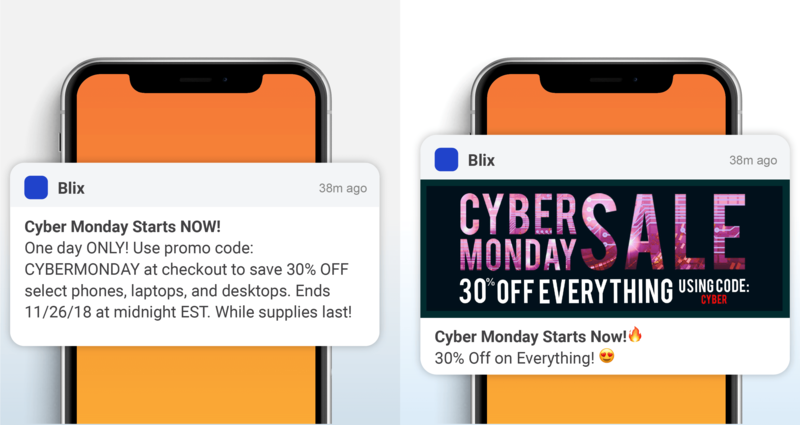 Blix used multiple emojis to emphasize their extravagant 90% off sale this Black Friday and saw a 28.3% increase in conversions over the Black Friday weekend. Users receive a multitude of push notifications over the weekend, so you only have a few seconds to grab your user’s attention and convince them to tap your push notification.Don’t overcomplicate your messaging! More text means a smaller chance of users clicking on it. Trending Apparel, an online urban apparel clothing app, sent a simple notification early morning on Cyber Monday and saw 3x its usual CTR. Push is an essential channel for engaging users over the Black Friday weekend — and beyond. Knowing which tactics are proven to work is an important step in giving your brand a leg up on the competition when it matters most. We can’t wait to see what new mobile marketing and user engagement trends the rest of the holiday season reveals! For more data-driven insights on building successful holiday campaigns, read 6 Mobile Marketing Tips for Brilliant Holiday Campaigns from Fender.